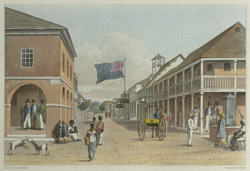 This plate depicts the crossroads of the two principal streets in Kingston: Harbour Street and King's Street, and is taken from James Hakewill's 'A Picturesque Tour in the Island of Jamaica.' The two buildings on the corners are stores owned by Netlam Tory and John Mavis. Further down can be seen the Custom House (with the high roof) and Harty's Tavern (with the flag outside).